The Optimum Nutrition Gold Standard Whey is something you should consider if you want to gain more muscles and lose body fat. Whey protein contains an array of vitamins and minerals to support muscle growth but it doesn’t add up to your weight. Each serving of contains 24 g of premium whey protein that helps in gaining more muscles and 5.5 g of naturally occurring branched-chain amino acids (BCAA). It’s also good for your health with just 1 g of fat, 1 g of sugar and 3 g of carbs. 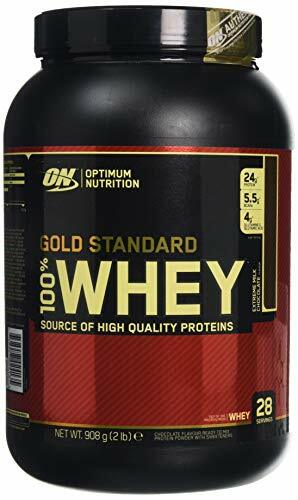 With over four thousand satisfied customers and almost five stars on Amazon UK, the Optimum Nutrition Gold Standard Whey can be considered as best-known whey protein powders in the market today. This whey protein powder also made its way to our list of Top 10 Protein Powders for 2018 and it comes in a variety of delicious flavours that can be an alternative dessert minus the sugar and fat! What’s in the Optimum Nutrition Gold Standard Whey? The protein blend on the Optimum Nutrition Gold Standard Whey consists of whey protein isolate, whey protein concentrate, and whey peptides. This isn’t the best protein blend out there but it’s fairly reasonable for its price. Isolate is the purest form of whey protein, whey peptides are partly broken down and are easier to digest, while concentrate can still contain some of the natural fat that occurs in whey. If you want to get the greatest form of whey protein, you should look for one that contains whey protein hydrosolate as these are the easiest to digest but they’re typically more expensive. Nonetheless, the Optimum Nutrition Gold Standard Whey protein powder stands out among its competitors as it contains a high amount of BCAAs with 5.5g. BCCAAs are proven to speed up muscle growth and help in muscle recovery. Optimum Nutrition was able to create a healthy whey protein powder without compromising the taste. This protein powder only contains less fat, sugar and carbs while most protein powders from other brands add fat and sugar in order to make the product taste better. If you’re not really a fan of protein shakes but you need it to gain more muscles, consuming this whey protein won’t be a frustration for you. You can choose from the 14 different flavours available which all taste great. The most popular ones are Banana, French Vanilla Creme, and Double Rich Chocolate. The quality of the whey protein powder combined with the tasty flavours made the Optimum Nutrition Gold Standard Whey famous all over the world. It’s easy to mix with beverages and it has a smooth texture which will make you look forward to drinking it each day. Is Optimum Nutrition Gold Standard Whey Effective? The mixture of whey protein isolate, whey protein concentrate, and whey peptides make the Optimum Nutrition Gold Standard Whey a great choice for muscle growth. Each of these whey forms contributes to muscle improvement and they all play different roles so mixing them all together is a smart tactic by the manufacturer. With a total of 24 grams of protein, 5.5 grams of BCAAs, and 4 grams of added glutamine, it’s very likely that you’re going to notice some results after continuously consuming the Optimum Nutrition Gold Standard Whey. According to the manufacturer, it’s best consumed either first thing in the morning or 30 minutes before or after your workout. This whey protein powder is easily absorbed so you won’t have to worry about feeling bloated everytime you drink it. However, whey protein powders are recommended to be considered as a post-workout meal because this is the time when your muscles need it the most. What’s the Best Way to Consume It? The Optimum Nutrition Gold Standard Whey can be easily stirred with a spoon, shaken, or blended with your choice of beverage. It depends on how you want to consume it but it could be with water, milk (any type), or with fast-acting carbohydrate drinks. The recommended ratio with every serving is one scoop of the whey protein powder mixed with 8-10 ounce of your choice liquid. You can add up to 3 spoons each time depending on how much you’re required to consume. The PhD Nutrition Diet Whey Protein Powder claims to be the original weight management protein powder. It’s low in fat, sugar and salt and it only contains 91 calories per 25g serving. The protein blend in this particular powder is a mixture of whey protein concentrate, micellar casein and soya protein isolate. In addition, the protein blend also consists of waxy barley flour, which is an innovative carbohydrate source that’s made from the finest barley crop. This whey protein powder has 9 outstanding flavors to choose from such as Raspberry and White Chocolate, Salted Caramel, and Vanilla Crème. 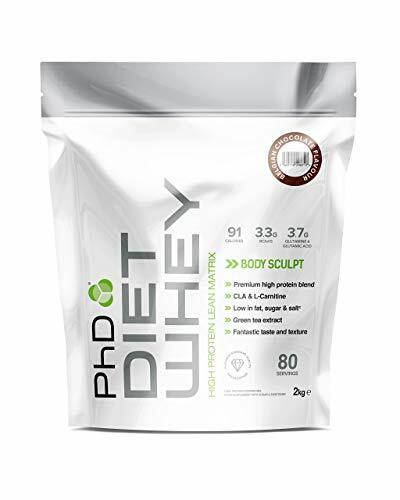 PhD Nutrition Diet Whey Protein is your ideal supplement to attain a healthy lifestyle and control your daily calorie consumption. If you prefer a protein powder that’s absolutely plant-based, this one might suit your needs. 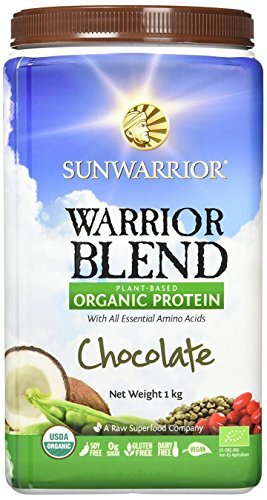 The Sunwarrior Organic Warrior Blend Protein is made from the combined power of hemp seeds, peas and goji berries so you’re ensured that there are no animal products included in this product. How will these plants sustain your daily nutritional needs? Well, peas contain almost 90% of high-quality protein and is 95-98% digestible while hemp seeds are considered as a complete protein source, containing a substantial dose of vitamins, healthy fats, minerals, fibre, and chlorophyll. In addition, goji berries are known to be a nutritional powerhouse for the longest time already. This protein powder is available in three flavours, namely Chocolate, Natural and Vanilla. 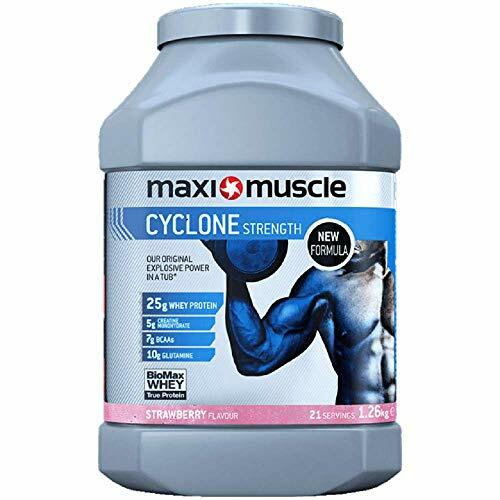 Maximuscle Cyclone Whey Protein Powder is an all-in-one shake created to meet the specific needs of fitness enthusiasts. It contains BioMax Whey True Protein blend which mainly consists of whey protein concentrate, isolate, hydrolysate and other healthy ingredients. This protein powder is rapidly digested by the body and it supports muscle development and growth. If you want to take your training to the next level, the creatine in the Maximuscle Cyclone Whey Protein Powder can help you in attaining that goal. This protein powder is low in sugar, high in protein and it aids in muscle growth. With their Gold Standard 100% Whey Protein Powder, Optimum Nutrition gives you the value for your money. It isn’t the most affordable one on the market but this product stays true to it’s word. The ingredients are all nutritious and it has BCAAs and added glutamine that support your muscle growth. With all the great tasting flavours, you’ll definitely look forward to your next workout session as you’ll get to consume your protein shake afterwards.